1) The paper was presented at the FIG Commission 3 Workshop and Annual Meeting in Iasi, Romania and was selected among the papers at the workshop to be FIG Article of the Month. The article focuses on the BDI – Real Estate Comparable Database Project, created to provide a strategic tool to all entities operating in the real estate sector. The Banca del Dato Immobiliare (BDI – Real Estate Comparable Database) is a project spearheaded by the College of Surveyors and Graduate Surveyors of the Province of Ascoli Piceno developed in 2014. The pilot project was created to provide a strategic tool to all entities operating in the real estate sector, for example: as a market analysis and asset management tool for enterprises; for Jurisdictional authorities, the project would offer greater guaranty and transparency on judicial sales and division while reducing eventual divergence between the real estate value and price; for real estate valuers and appraisers, it serves as an essential instrument in order to remain compliant with the International Valuation Standards, Real Estate Valuation Code by Tecnoborsa, the ABI Guidelines, the UNI 11558 and UNI 11612. 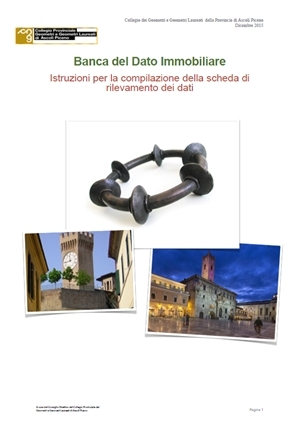 The BDI project was developed with the valuable and active cooperation of the Order of Notaries Public of the Province of Ascoli Piceno, with its members communicating a summary datasheet from every deed of sale executed starting from the 1st of February 2014. The elaborated data, which are potentially new “comparable property,” are then inserted in the digital database. The BDI can therefore provide precised geo-referenced and filtered data, optimized by “feature” or characteristic of interest in order to favor faster and informed decision making procedure thus, saving time and money. This paper aims to illustrate the project, from the data acquisition technique used, the archiving process and the planned GIS database using the comparables previously gathered and stored. Moreover, this paper will also look into the project’s socio-economic impact on one of its macroterritory: Ascoli Capoluogo. La Banca del Dato Immobiliare (BDI) è un progetto promosso dal Collegio dei Geometri e Geometri Laureati della Provincia di Ascoli Piceno. 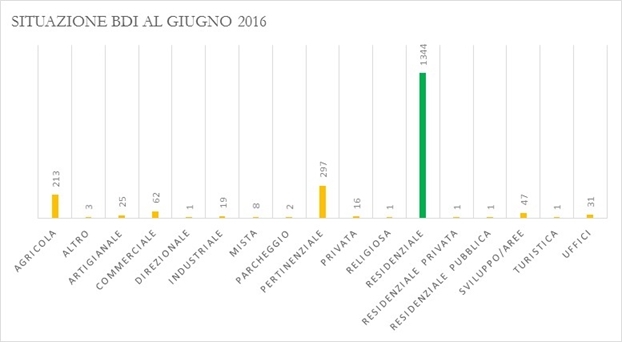 Organi Giurisdizionali, per ridurre drasticamente le divergenze tra valori e prezzi offrendo maggiori garanzie e trasparenza nelle vendite giudiziarie e nelle divisioni; professionisti Valutatori Immobiliari che devono operare nel rispetto degli Standard Internazionali di Valutazione e del Codice delle Valutazioni Immobiliari di Tecnoborsa, delle Linee Guida ABI, della Norma UNI 11558 e della Norma UNI 11612. Il progetto della BDI si sviluppa con la preziosa e fattiva collaborazione dell’Ordine dei Notai della Provincia di Ascoli Piceno il quale, attraverso i suoi iscritti, comunica i dati sintetici derivanti dalla stipula di ogni compravendita a partire dal 1° febbraio 2014. I dati, opportunamente “lavorati”, vengono poi inseriti in banca dati. La BDI fornisce quindi ai soggetti che ne fanno richiesta la possibilità di ottenere dati georeferenziati e filtrati, ottimizzati allo scopo per le caratteristiche d’interesse al fine di operare le proprie scelte con maggiore cognizione e rapidità e risparmio di tempo e danaro. Questa ricerca illustrerà il progetto stesso, dall’acquisizione dei dati, l’inserimento dei dati raccolti ed il successivo progetto di plottaggio su una mappa digitale in piattaforma GIS. La medesima ricerca osserverà anche l’impatto socio-economico del progetto, soprattutto in una delle proprie macroaree, ovvero della circoscrizione Capoluogo. The Banca del Dato Immobiliare differs from that of the government digital cadastral database in terms of the ability of the technicians that use the extracted data. The pragmatism of Italian surveyors, their nature to be concretely technical and their ability to also exploit the few and minimal information to get the best result, set up the necessary flexibility to manage such a project in continuous evolution along with other successive information. The data properties that are needed for the purpose of estimating, appraisals, and market analysis are few. Starting with a few readily available data, a joint collaboration with the Provincial Order of Notaries Public, and a few surveyors who have devoted much of their time, it was possible to create a strategic tool fundamental for all those who work within the real estate sector. It is now a stable propensity of Italians to save, with deflationary consequences resulting from the sharp drop in consumption. Despite the recent strong global crisis, the current social-economic situation is generated by the lack of availability to risk or at least, to notice that there is more willingness to address them outside the national borders. There is a clear lack of interest in investing in Italy. The reasons are many but certainly solvable but with the right commitment from political resources and the availability of social forces. It is now established that investors, whether they are Italian or foreign, need transparency, continuity, and socio-political trust. Alternatively, an investment is carried out only with the inevitable speculations. The BDI project falls in our continuous commitment to transparency and reliability. In November 2014, the Tribune of Ascoli Piceno noted the importance of utilizing a standardized estimation methodology. Other Provincial and Regional Courthouses soon then followed such initiative, requiring of the introduction of the said methodology in an expert’s report. However, the Provincial College of Surveyors of Ascoli Piceno decided, at least, to primarily limit the content of the database only to the concept of "price" and therefore excluding temporarily the concept of "value." In doing so, it was possible to temporarily and greatly reduced the number of data (about a thousand). At the same time, it was necessary to also focus on the reliability of the datum. With that in mind, the valuable collaboration with the Order of Notaries Public, who shared the project and who have also understood the functional potentiality as a strategic market analysis tool. Obviously, to get a sufficient amount of data needed to be able to carry out UNI-compliant valuations, or to do market analysis, it would have taken at least six months or so of data collection. The College of Surveyors of Ascoli knew of the extraneous amount of sourcing to proceed with the project but was sure that the efforts would be worth it. Only when real estate appraisals will be conducted in the Standards, and are in compliance with UNI, the inclusion in the database of the "value" could be undertaken. This is to ensure more points of comparison and to fully understand the divergence between market values and market prices. On the 11th of December 2014, in Rome, a Memorandum of Understanding was signed between the President of the National Council of Notaries Public, Maurizio D'Errico, and the President of the National Council of Surveyors and Graduate Surveyors, Maurizio Savoncelli, to start a collaboration between the two categories, aimed at making the proceedings of land transactions in line with the highest safety standard for town planning and building profile. The agreement provides disclosure of real estate transfers integrated with an optional technical report, drawn up by a surveyor. The said document should demonstrate cadastral due diligence, and a construction and urban analysis. On this day, the notary is able to ensure an absolutely safe transfer in terms of marketability of real estate. Thanks to this technical report - written in behalf of the seller, and determines specific indications and requests from the notary - as much security will be guaranteed even under the technical examination profile on the building’s conformity. In this way, every party involved in the negotiations will have the certainty of the conformity of the building, at the same time, it lowers the incidence of litigation and administrative procedures for unconformity amnesty. To enhance the skills, to stimulate the development of their activities, and to promote initiatives inspired by the collaboration between the technical professions, are the principles that inspired the birth of this Memorandum of Understanding that the National Council of Surveyors and Graduate Surveyors agrees to uphold. It also wishes to expand access to other technical professions access to this database. Imagine how any company that has an interest in developing any investment from the smallest to the largest, can obviously be interested to contain the risks involved, especially in cyclical times of market dealings. Investment analysis is based on a huge amount of data and numbers: prices, values, costs, time, size, types, locations, demographic prospects, urban perspectives, environmental and socio-economic issues. Similarly, the Real Estate Appraisers, who are about 500,000 people sparsed on the national territory, will have to deal with the irreversible process of professionalization, adapting to the norms set by International Standards. The Real Estate Appraisers also have essential need of reliable data to compare and to capitalize in compliance with UNI 11558, and UNI will soon be passed and will be in line with Market Value Approach of the Project UNI U98000240. Today, over 75% of credit institutions which already operating under the restrictive rules of AQR (Asset Quality Review), require their “consultants” to possess at least, the ISO17024 certification by February 2016, and to follow the A.B.I. Guidelines for Business Lending Valuations. The interest then may have very important implications for Court procedures and Civil Cognition Process. First, there is opportunity to provide the adequate transparency by demonstrating a real estate’s Market Value as defined int art. 4 par. 1 letter. 76 of Regulation no. 575/2013 - Capital Requirement Regulation, thus justifying the succeeding base bid price. This ensures the debtor a more responsive valuation of the property with the possibility of eliminating speculation. On the other hand, this gives the creditor a quicker solution to the Procedure; Finally, it provides security based on a weighted investment derived from certain necessary data. For the Cognition Process, it is of paramount importance to ensure the certainty of value for both parties in the event of court divisions, revocation, and in any other situation which requires transparency and demonstrable results. The BDI project is developed with the active cooperation of the Order of Notaries Public of the Province of Ascoli Piceno, which, through its members and affiliates, report a synthetic report from every deed or title transfer from the 1st February 2015. The data, suitably "processed", are then inserted in the database using a pre-existing database schema from a Stimatrix City, a known valuation software in Italy. The BDI therefore provides persons who request the opportunity to obtain geo-referenced and filtered data, optimized in order of characteristic of interest, resulting to a more informed and faster comparable searching and decision, so saving time and money. 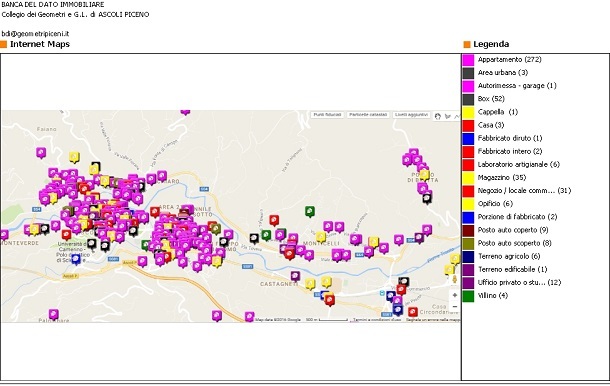 The project, which became fully operational and usable from the 11th December 2015, is integrated with complete sets of data usage and instructions readily available from the Provincial College of Surveyors of Ascoli Piceno’s webpage. Monthly developments are published regularly that allows analysis of multiple segments in each municipal area. 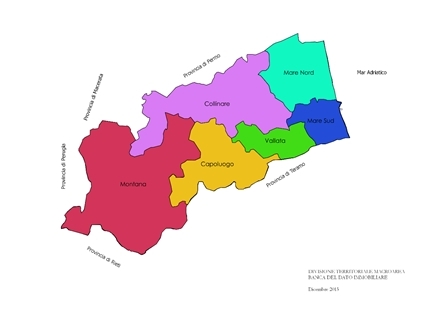 BDI covers the entire province of Ascoli Piceno, which is composed of 33 municipalities. Subsequently, all municipalities are grouped and divided in six macro-areas, each controlled and monitored by a Coordinator. The Coordinator of the Macro-area, oversees the management and collection of property data conferred by “technicians” verifying the correctness and completeness prior to data entry process in the database. The Coordinator monitors the area to detect any useful detail to identify or study recent the market trend/s, on new construction and/or renovation. As of October 2016, over 2100 data or “comparables” are inserted in the BDI database, with time range between February 2015 to June 2016. Data gathered on 2016’s third quarter are still undergoing validation and rectification. Figure 1 shows the Data collection results in the first one and a half year of the project. Each validated deed or title transfer are transcribed to a “comparable module” (on paper form or an excel sheet) handed by each coordinator. The format was designed to give emphasis to the specific characteristics that are essential for valuation purposes. Each “characteristic” from the module, once inserted on the Stimatrix City’s database, are transformed automatically into features of the integrated GIS of the software. Furthermore, the cadastral data of each real estate subject of the deed, allows the GIS operator to geo-referenced or allocate the real estate precisely on the map. In rare occasion, when the module was completed with errors, further research on the exact building location is conducted. 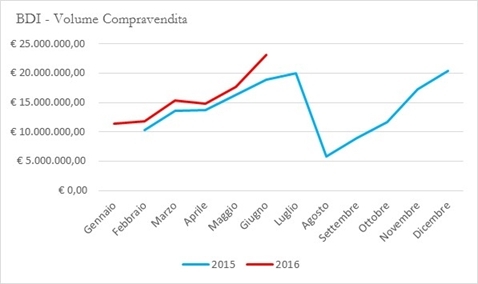 Figura SEQ Figura \* ARABIC 1: Andamento temporale di inserimento dei comparabili tratti da recenti compravendita archiviati nel BDI fra febbraio 2015 e giugno 2016. 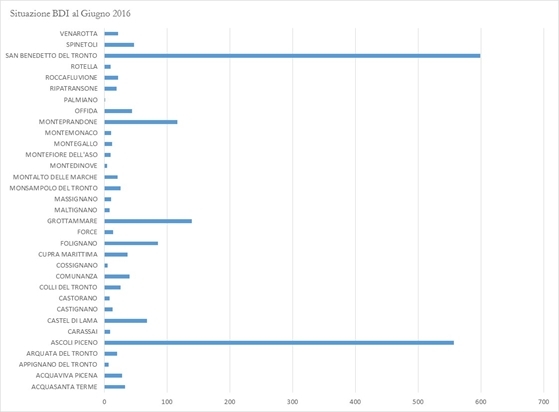 Out of the 2190 data archived in the BDI database, around 2072 are extracted which are from the Province of Ascoli Piceno. 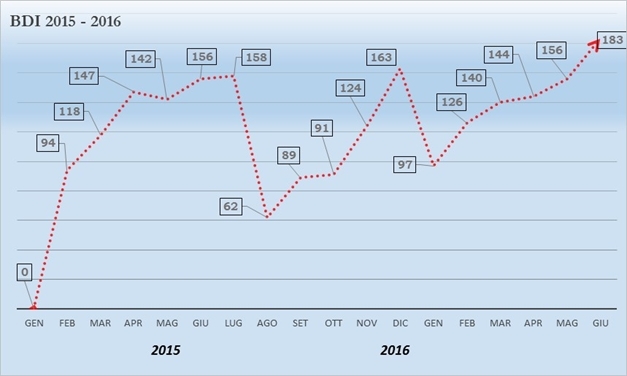 The other data reported and sourced were from the nearby provinces of Teramo, Fermo and Macerata (Image 2). Among the various real estate destination, residential buildings were the most contracted type with 1344 deeds registered, followed by Building Accessory (Pertinenziale) and lastly, Agricultural lands. 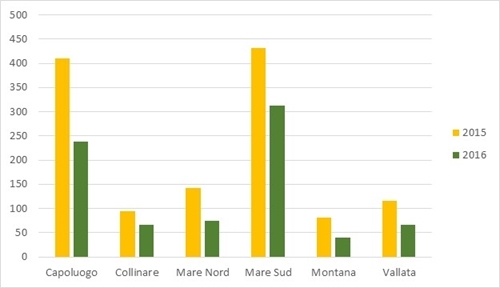 The data shows that despite the fact that the Capoluogo hosts the provincial capital, Ascoli Piceno, the Macroarea of Mare Sud seems to be more active with real estate transactions, surpassing the Capoluogo by 37.8% in 17 months of the Project. This trend seems to be consistent both in 2015 and 2016. The Municipality of San Benedetto del Tronto seems to have a slightly more active real estate market despite having a smaller area. 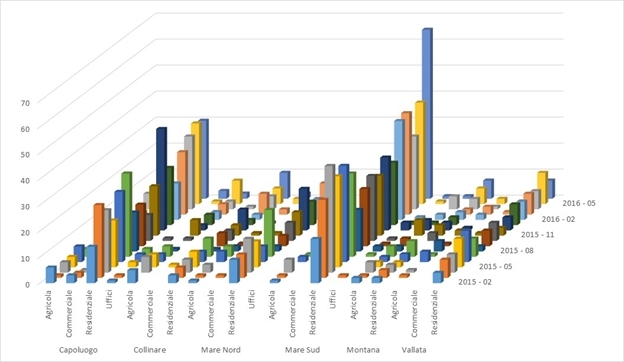 Further analysis seems to indicate that the reason for this trend is because of the geographical location of San Benedetto del Tronto (seaside) and the abundant number of medium to high rise condominium. On the other hand, small Italian borghi have a limited amount of data reported, thus, it could be hypothesized that they have limited demographic movement. 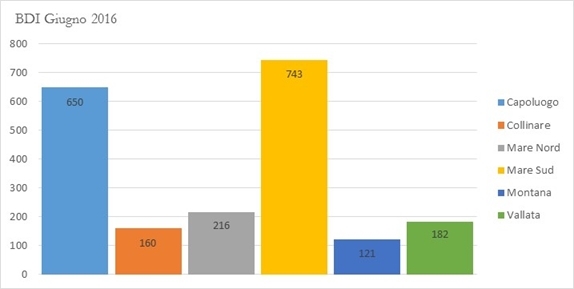 In figure 8, it is interesting to see that the total volume of title transfers, in terms of price registered, for the first six months of 2016 have already surpassed the total volume per month of the previous year. Despite having a negative market caused by the recent recession of the last decade. It could be easily assumed that a sudden decrease in the numbers of titles transferred will also happen in august 2016 when most offices would be closed for the summer holidays. 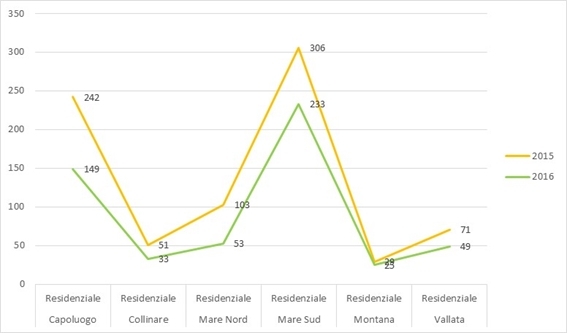 Interestingly, Ascoli Piceno's historic city center and the nearest neighborhood of Porta Maggiore (figure 9) seem to be the preferred location of most residential transactions despite having some socio-political issues (i.e. lack of adequate car parking space, elevated amount of carpark subscription, limited access to public and private transportation, limited construction interventions, strict compliance of cultural and historic construction preservation, higher property tax quotient), in relation to newer neighborhoods and residential expansions (Monticelli, Maltignano, Folignano). One further improvement that the BDI project could have is to include more detailed technical characteristics of the real estate, or some data that could help identify the parties involved in the land transfer (age group, previous residence area, private or company, etc). This kind of demographic data could give a better understanding on different urbanization phenomena and could easily help further research on urban development of a certain market sector. A sincere thank you goes to the Provincial College of Surveyors of Ascoli Piceno, in the person of Geom. Leo Crocetti, the College President, and Geom. Angelo Crescenzi who spearheaded the BDI project, both of which have been very helpful despite the setbacks and sacrifices to be able to materialize an idea into a working and evolving project.